Swiss Chard replaces Spinach during the hot summer months and is as easy to grow as beets. 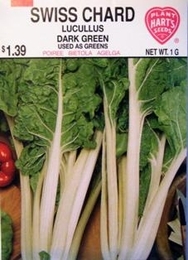 The leaves are usually cooked like Spinach. The White midribs are excellent creamed or as a substitute for Asparagus. Rich in Vitamins A and B. make cutting of the leaves about 1 inch above the ground and new leaves form allowing continuous harvest through the season until frost.